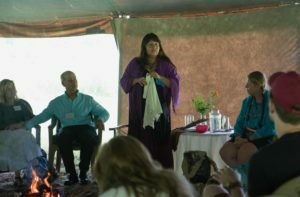 The Voices of Wisdom event at the beautiful Blue Deer Center was a powerful experience and many of us who attended feel we grew significantly from participating in it. Gail Whitlow, a Mohawk Elder, presented first, explaining that for centuries, prior to the white people’s arrival, her Mohawk ancestors had used this land for sacred gatherings. Gail gave us a deep feeling of gratitude for the land, the river, and for all who hold us in this time. She then led us in a moving ceremony, the Condolence Ceremony, which began with each person cutting a piece of soft white deer skin and gathering in pairs. Gail helped each of us to access the grief of the wrong doings we and our ancestors have suffered, and we wiped each other’s tears with the beautiful soft white deer skin. The circle felt united in the depth of the emotional space. 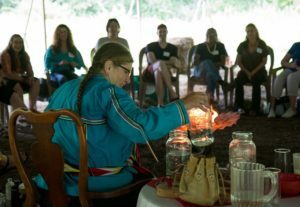 Next, Dr. Jody Noe, a Naturopath and Cherokee medicine woman, talked to us about listening to our inner wisdom, about following that guidance to find healing for ourselves and to help others heal and grow in connection to the Divine. Dr. Noe was very encouraging. Her life story gave us hope that following the guidance to the Heart, although risky, can produce a life lived with great meaning. After closing the circle, we went to the sacred river that runs near the Blue Deer Center. There we participated in a Water ceremony, joining the waters we had brought with us, waters that hold meaning for us, with sacred waters from other places and with the river. The program began again the next evening with a fire to which we were able to give offerings if we chose. 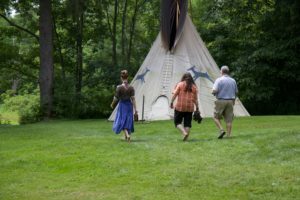 People began to share the profound emotions that had experienced following the words and ceremonies of Gail Whitlow and Dr. Jody Noe. Many were still experiencing grief. Several people shared their piece of white deer skin with others to wipe their tears and console them. 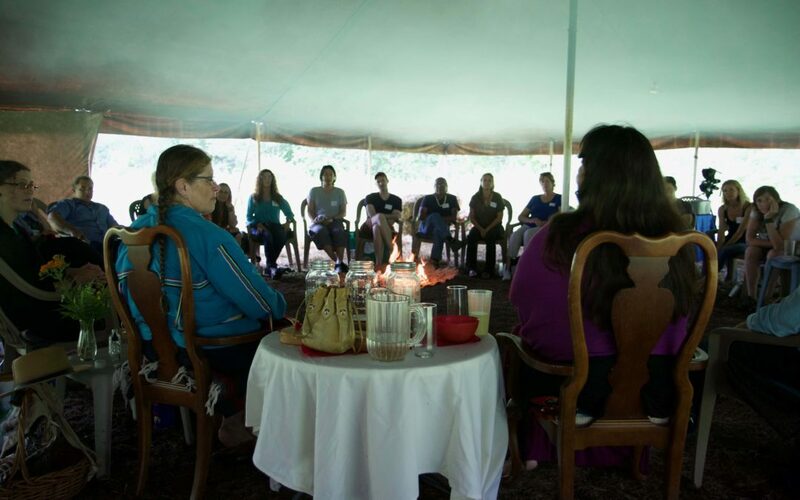 As the group shared their experiences, the energy began to shift to a feeling of being heard and witnessed. The group experienced a common heart and people expressed feeling no longer so alone in their lives. New people to the event voiced their desire to return for more events and for community fires.